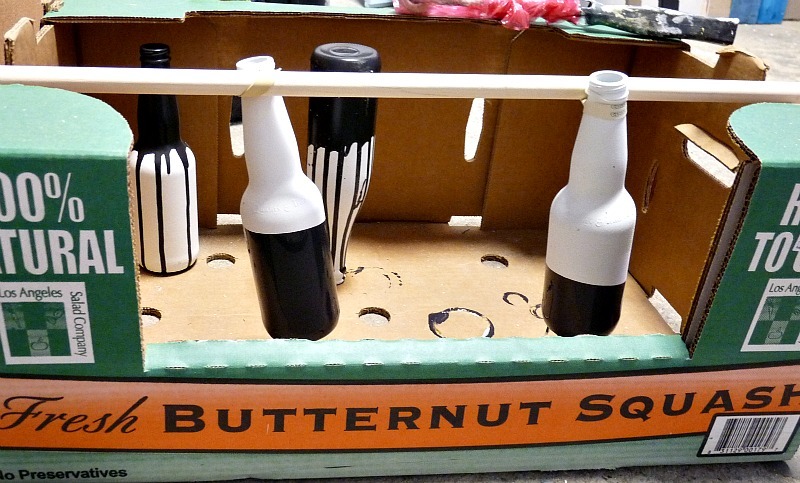 When I painted the wine bottles, I tackled a few beer bottles too. But they somehow didn’t look as pretty to me, so they hung out in the garage a bit, getting dirty and doing a good impression of the worst trip hazard ever. 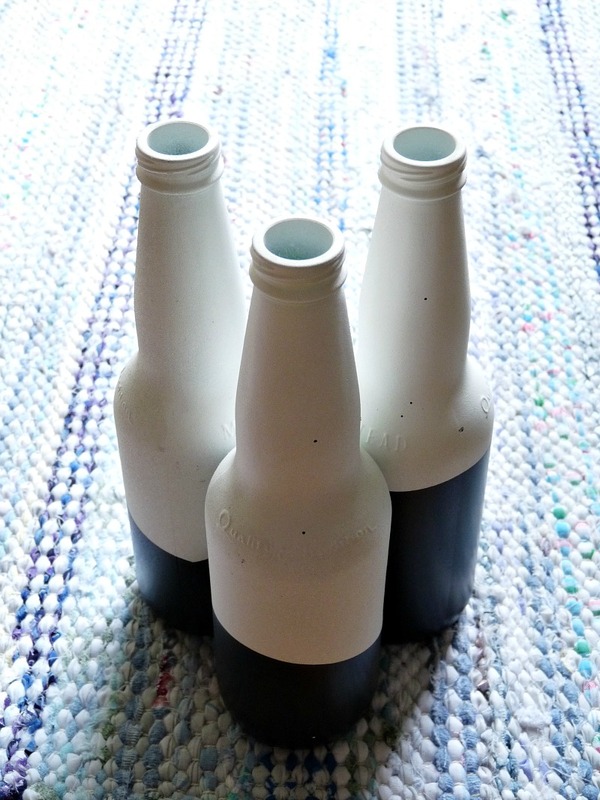 Then I saw some cute dipped vases on Pinterest and started thinking maybe a little swim in some paint would make the painted beer bottles prettier. But these were just thoughts. Set to the tune of this song. Because my “dipped” wooden spoons and “dipped” stool turned out so well, I got too confident. I think you can guess how this story ends. 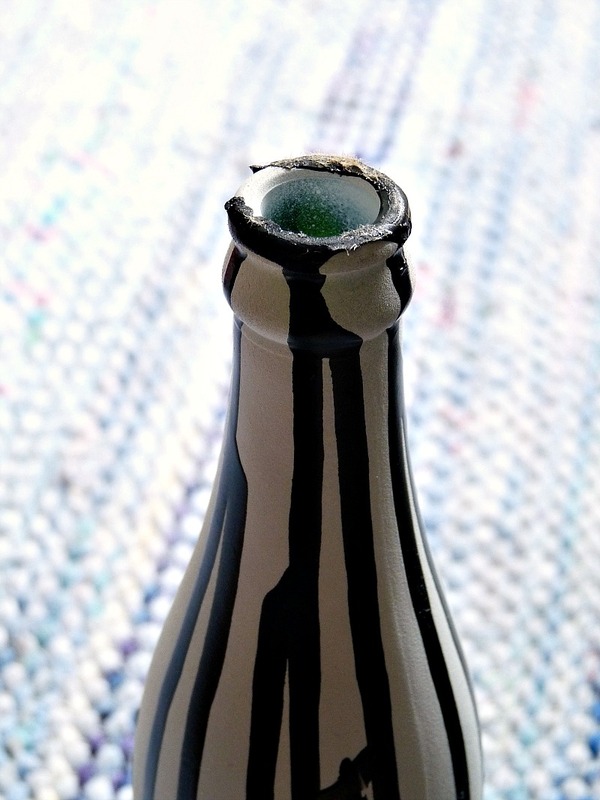 I literally dipped my bottles in paint and they hung out for a bit longer in the garage, proving they could be an even more aggravating obstacle. And no, we didn’t buy this much butternut squash. Some of my drippy-dips friggin’ stuck to the cardboard . . .
Well, you win some and you lose some. C’est la DIY. Care to share any of your own less-than-successful projects? P.S. Don’t forget to enter my current giveaway – it’s a real life saver. Oh, sadface. I actually really like how the drippy ones look! Too bad they stuck to the cardboard. Will you try again? I think bottles and I are over. 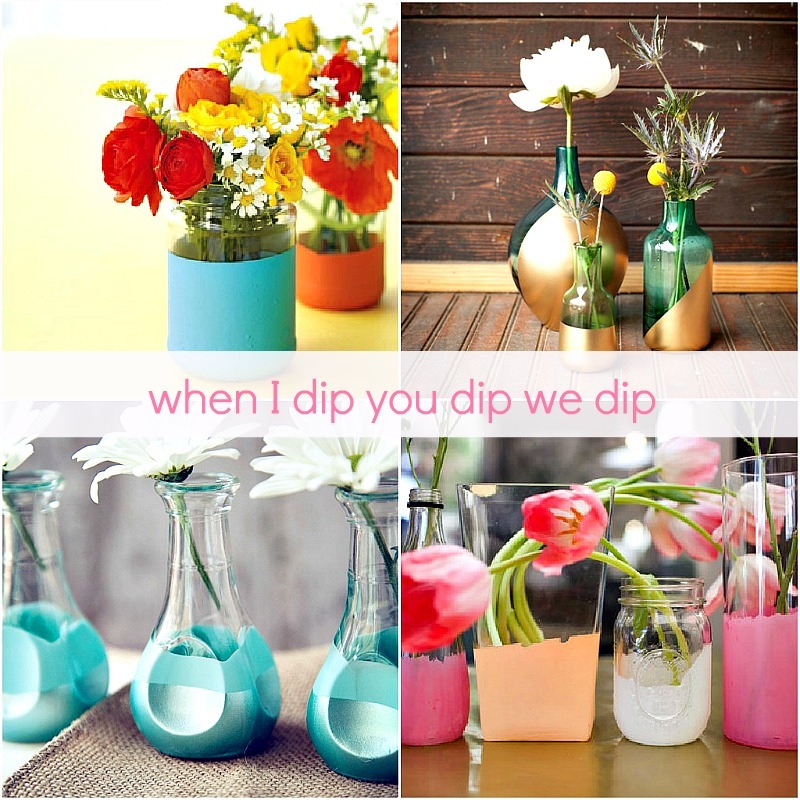 But I still like the dipped look, so maybe with vases, for a chicer look? We'll see. I have about a dozen DIY's on the go right now – hopefully they all turn out better! Um, not a totally fail. I think the last set looks ok! Awww, you're too kind! Back lighting them helped, lol. Listened to your recommended music "Da Dip" while reading this post – too funny! I appreciate craft fail posts because they steer me away or caution me about certain projects that may not turn out like all the spectacular photos on Pinterest 🙂 Thanks for posting this – the music put a smile on my face! 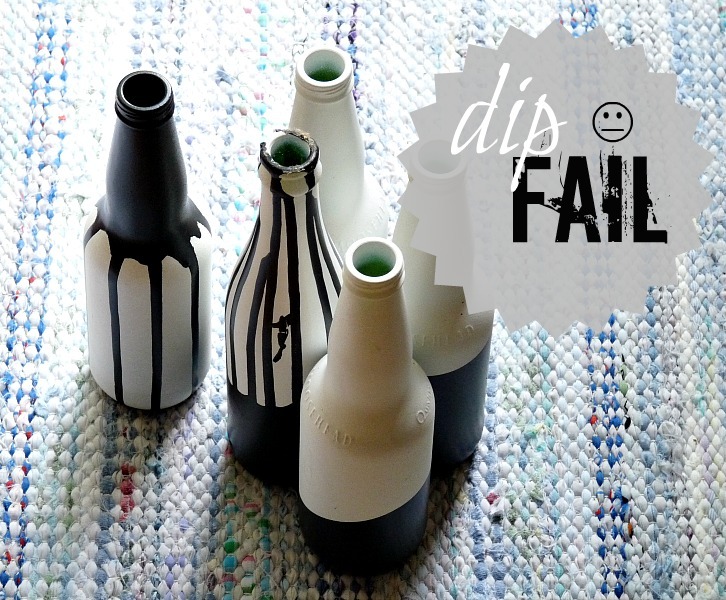 As embarrassing as it is to post it, I love reading a good craft fail too, so I figure I have to share! I still think dipped vases would look pretty and hanging them worked well. Letting them drip onto cardboard was just silly of me.Happy you like the tune! Aww, they're not too bad. But it's hard to compare with that awesome dipped leg stool. I documented my similarly unsuccessful paint project here. Oh well! So true! 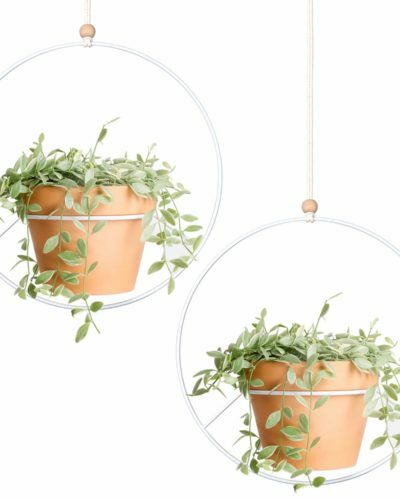 I'm already bouncing back and priming my next DIY! And, if it's a fail, I'll blog about that too, lol. argh! that must have been frustrating..why dont you try using mason jars instead? or other types of vases…that'll look great as well. We did a tutorial on using acrylic paint with mason jars (how2home.wordpress.com/2012/06/13/diy-flower-pots/)…it took literally 24 hours to dry ;( it was such a pain…but it turned out pretty nice. We use them as vases at home. Try it again! Don't give up tanya!! Maybe partial fail? The solid ones look promising!! Awww, thanks Dora!! I appreciate that. I would have probably failed at this too. even dip painting makes me nervous! Jót mosolyogtam a zenei aláfestésen :). Őszintén szólva nekem is elrontottan is nagyon tetszenek :). 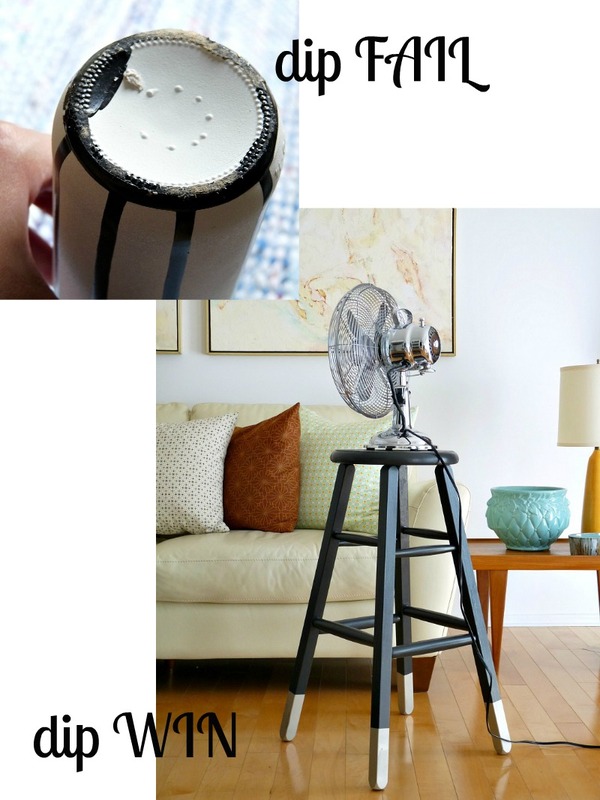 Aw, nothing like a good DIY fail – I'm with you guys, I love reading about what doesn't work out sometimes. I'm wondering if you could rig something up that would hold the vase as you dipped, and also could be used as a hanger so that you could hang it to dry… thinking… thinking… I love the look of this though – especially the vases, might give it a go since plain glassware is so cheap!PS – I just bought a dolly little vase that is crying out for some felted billy buttons! Better get felting, missy! I want to see!! Or wait, were you hinting at stealing mine? LOL. Your table turned out perfectly! I love the turquoise colour you chose – it's so vibrant and cheery!